(Family Features) It can be easy to impress your guests without overdoing it in the kitchen by putting to use recipes that require little time to prep. After all, those precious moments with loved ones are meant for reflection and conversation, but that doesn’t mean you have to settle for lesser dishes. 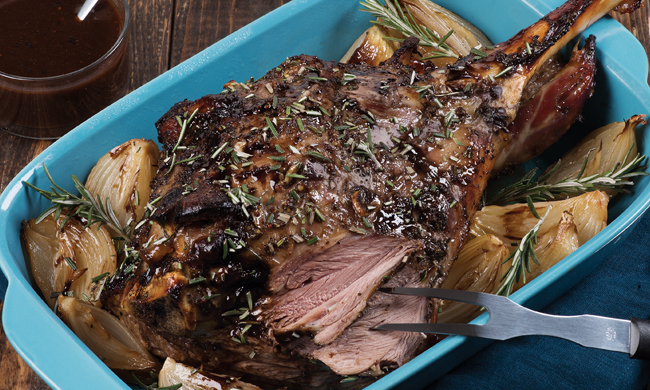 Go above and beyond with the main course that’s prepped in 10 minutes and ready in less than two hours like this Rosemary and Raspberry Balsamic Roasted Leg of Lamb, which can be the center of attention as guests dig in for a delightful meal. Find more recipes that can take your gathering to the next level at filippoberio.com. To make Roasted Leg of Lamb: Heat oven to 400° F. In a bowl, whisk olive oil, raspberry balsamic glaze, rosemary, and mustard; set aside. Make small incisions in lamb and insert garlic slices. Rub olive oil mixture over lamb. Sprinkle with salt and pepper. Transfer to a roasting pan fitted with a rack. Add onions; pour water into the bottom of a pan. To make Gravy: Place roasting pan on the stovetop over medium-high heat; stir in flour. Whisk in wine; boil 1-2 minutes, or until reduced by half. Whisk in chicken stock and raspberry balsamic glaze. Add rosemary; bring to boil and simmer 8-10 minutes, or until thickened. Season with salt and pepper. Serve with lamb. Mix graham wafer crumbs, oil, and sugar; press into bottom of 9-inch springform pan. Bake 8 minutes; let cool. Reduce oven temperature to 325° F.
To make Filling: In a heatproof bowl set over the saucepan of hot (not boiling) water, melt chocolate, stirring until smooth. Remove from heat and stir in a balsamic glaze. Let cool slightly. Using an electric mixer, beat together cream cheese, sugar, and melted chocolate mixture until light and fluffy. Beat in eggs, one at a time. Beat in sour cream and vanilla; pour over crust. Wrap outside of springform pan in heavy-duty foil. Set inside roasting pan and pour in boiling water until halfway up sides of springform pan. Bake 90-100 minutes, or until sides are set and center is still slightly jiggly; cool 5 minutes. Run a knife between cheesecake and pan; cool completely. Refrigerate 24 hours. To make Cherry Topping: In a small saucepan over medium heat, bring cherries, sugar, olive oil and 1/2 cup water to boil. Reduce heat and simmer 5-6 minutes, or until sugar dissolves. Transfer to a bowl; cover and refrigerate at least 2 hours or up to one day. Spoon over cheesecake; drizzle with balsamic glaze. Using chef’s knife or mandoline, thinly slice beets; arrange on the platter. Heat oven to broil; position rack at the highest level. Brush olive oil over both sides of each slice of bread; broil, turning once, 3-5 minutes, or until golden brown. Rub cut side of garlic clove over bread while still hot. Watch the video on how to make this delicious recipe!